So...it may or may not be a coincidence that my blog layout has the same colors as the University of Texas at San Antonio. And it may or may not be a secret that I ♥ UTSA. My husband and I are proud alumni, and we thoroughly enjoy giving back to the University and supporting different sports. For the inaugural football season, we purchased season tickets for our family four pack and have been looking forward to the fall seasons every year! Higher Education Exposure - We are 1st generation college graduates, and exposing our children to higher education is super important. This exposure can open up their mind and create goals that may not have ever been there before. Scheduled Family Time - You paid for it ahead of time, so you will most likely keep up with the schedule and you will have enough time to be as prepared as needed! Rooting for the Home Team - There's nothing better when one of us shouts "UUUUUUU TTTTTTTTT" and one of the kids ends it with "SSSSSSSSSSS AAAAAAAAAAAA"
Going Local - Not just economically, but when you support the university, you help it produce quality graduates. High quality graduates become successful professionals, they stay in San Antonio, and our community keeps getting better and better. Tier One, here we come! FUN - The tailgating, bands, music, Rowdy Town, Roadrunner Station and the pre-game fesivities are just as fun as watching the game! Tickets are available for all sports at the UTSA Athletics Ticket Office online or give the box office a call at (210) 458-8872 for more info, the guys are great there! 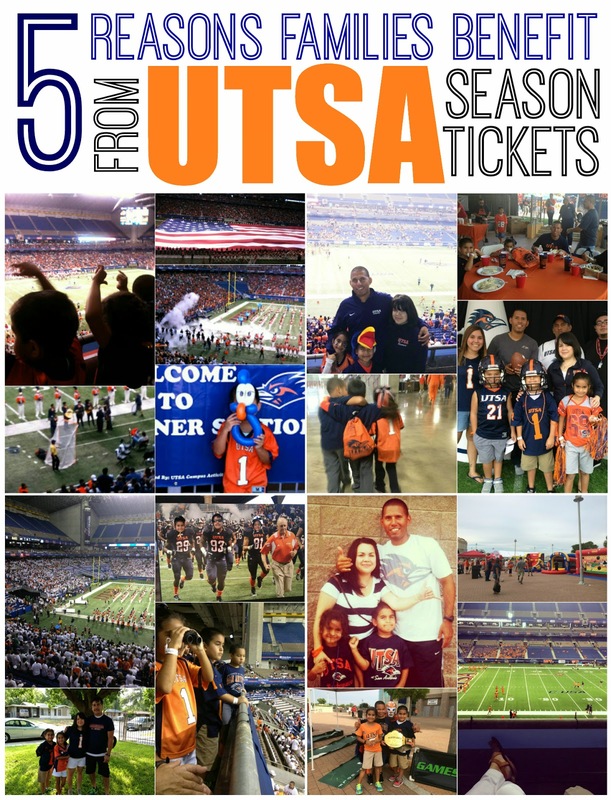 If you've already got your tickets, check out my round up of UTSA gear for everyone in the family! Have a question? Leave me a comment and I would love to help! And see you at the Dome! Go Runners! Meep Meep!!!!! Just ran my season tickets back for the 2nd year. I will always have them......... its ridiculously easy to keep your season tickets year after year. catching up on my reader ... great job on this one! !